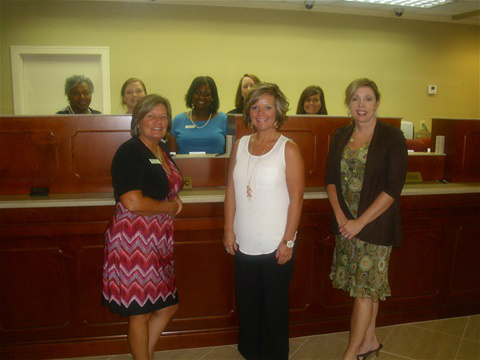 I’ve noticed this particular bank, First Federal Bank, is run by all women. When I thought about it, I realized, I couldn’t remember the last man who worked there as a teller or higher up. After thinking about it for a while, I went in and talked to Lori Lowell, the branch manager, or VP of this bank’s franchise. The top three ladies in charge are Lori Lowell, VP Branch Manager and employed for over twenty years; Angie Bruinooge, Assistant Manager and employed for over four years; and Charlene Britt, Financial Services Representative and employed for over fifteen years. Collectively, they are over their all-female staff of bank tellers and associates. “Is it hard to work together being all women?” I asked Lori. “Yes, exactly. Like our Monday morning meetings we try to lighten things up with simple staff games. We also do fundraising on different occasions such as holidays. We have Easter Egg hunts, different games, things like bake sales and such,” Angie answered, while going over the list with Lori. We talked a bit about some unrelated issues. You know, just girl talk. Then, I opened up the conversation for the other reason I wanted to write about this bank: They’re changing their name from First Federal to South State Bank. This bank is merging companies. For those who bank with South Carolina Bank and Trust, First Federal, Community Bank & Trust, The Savannah bank, Minis & Company Investment Advisors and last, but not least, North Carolina Bank & Trust, these companies and financial institutions are merging to become one bank: South State Bank. “Is this going to be a bad thing?” I asked both of them. Charlene wasn’t available to sit in, She was busy, busy, busy but, I’m sure her co-workers expressed her feelings as well. I was barely able to catch a picture of them all together before Charlene left for lunch. When asked about this merger affecting the customers and their banking experiences, I was assured everyone involved was trying to make this as easy as possible with as little effects as possible for their customers. All of the bank accounts, mortgages, loans, so on and so forth will be the same. It will be business as usual on the surface. It’s only behind the scenes the merger will change.